ON A hill at Gerehu Stage Two, which offers panoramic views of Port Moresby’s most-populated suburb, a massive property development over 31 hectares is taking place. Yumi Yet Properties, owned by Southern Highlands businessman Eke Lama, is cutting up the hillside to build more units which can be afforded by the average Papua New Guinean. He owns residential and commercial property all over Port Moresby and Mt Hagen. Mr Lama, for those who came in late, is known in Port Moresby as a man who is making housing affordable to hundreds of Papua New Guineans in Port Moresby, me included. These are simple, self-contained units, nothing fancy a’la Touguba Hill. “Currently, we have one-bedroom, two-bedroom and hostel-type rooms,” he says. “We have 237 units altogether in Port Moresby right now. 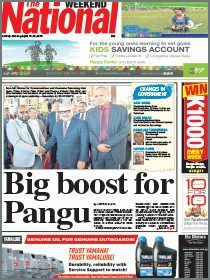 “We are renting out to average Papua New Guineans. “We are not ‘cutting their necks’ by giving them affordable accommodation. “Our units are at Four-Mile, Waigani and Gerehu. “Across the board, we are leasing for K600, K700, K800 or K900 per month for a one-bedroom unit. “Our two-bedroom units are going for K1,400-K1,800 per month. “Three-bedrooms are going for K1,600-K2,000. As we stand on the hill last Saturday marvelling at the view, Mr Lama points out where a proposed new freeway, once the LNG project gets underway, would pass through to Jacksons Airport. “I went to mission school in 1972,” Mr Lama tells me. “I finished my Grade Three in 1975. “I started my business in 1979 in my village, Wala, in Pangia, Southern Highlands province. “In 1979, with K200, I started buying cherry coffee at 20t a tin. “When I sold the coffee, I bought goods from Mt Hagen, which I used to run a trade store in Pangia. 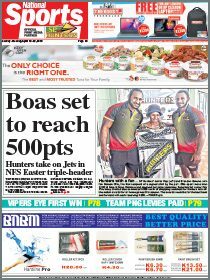 “I started running trade stores at Wala, one at Pangia station, one at Waigani, one in Mt Hagen and one at East Boroko.